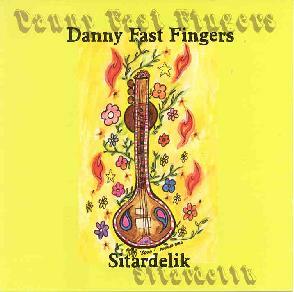 Danny Fast Fingers - "Sitardelik"
Ever since groundbreaking 60’s musicians like George Harrison, and Robin Williamson and Mike Heron introduced the wonderful East Indian instrument the sitar to folk and rock, its sound has become synonymous, at least to the Western ear, with all things trippy and psychedelic. I guess it was inevitable that someone would combine the psychedelic genre of electronica with the sounds of the sitar. Actually, I’m sure this has already been done before, but perhaps not by such a skilled player of the instrument as Mr. Fastfingers. Over a steady electronic rhythm, Fastfingers improvises on the sitar, wrenching sounds from it that are both traditional and unusual, from the familiar gently buzzing drones, to sounds similar to banjo and even something like an electric guitar. His sitar dances to a whirl of exotic melodies through four pieces that are all about 15 or so minutes in length, named after each of the four elements of the classical world: Fire, Water, Air, and Earth. The only downside of it is that Fastfingers is not as accomplished with the electronics as he is with the sitar. Using vintage 80’s technology, he sets up a fairly simple (and sometimes somewhat cheesy) electronic rhythm, which doesn’t really change throughout the entire piece. Fortunately, his sitar weaves such fascinating patterns around and through the rhythm that it makes up for the somewhat bland electronics. Almost, anyway. Instead of the album seducing you and drawing you into it as it should, it has a tendency to fade into the background. Still, it’s a mighty cool background. Now, if Fastfingers could join up with a musician who was just as creative with the electronics as he is with the sitar…ah, what sonic magic they could create. Here’s hoping it will happen! For more information you can visit the Danny Fast Fingers web site at: http://www.dannyfastfingers.com. Contact via snail mail c/o Fast Fingers Music Software LLC; PO Box 741; Rockville Centre, NY 11571.